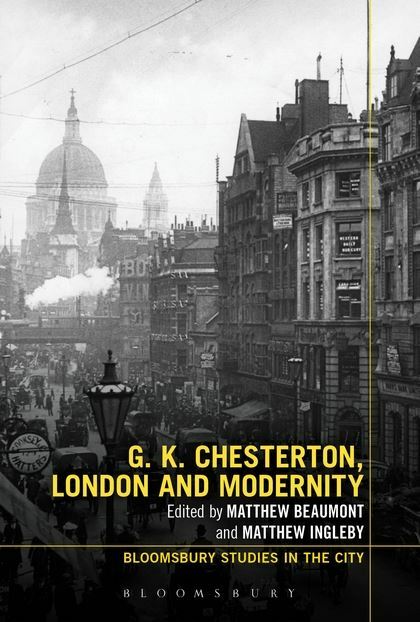 This lively and varied collection of essays on G. K. Chesterton’s complicated relationship with modernity, and his intricate rendering of London in his writing, does more than offer a corrective to the previous dearth of critical work on Chesterton’s attitudes to the modern city. Through careful examination of Chesterton’s contradictory opinions and light-hearted prose, a broader view emerges of what “modernism”, and indeed London, meant to the Edwardians. Chesterton is an enigmatic writer whose elastic prose is characterised by an unlikely combination of paradox, punning and moments of profound insight; as Lynne Hapgood comments early on in the collection, “Even Chesterton’s stylistic flamboyance in this novel, veering between the absurdist, the heroic and a kind of anticipatory surrealism, was par for the course in an Edwardian period when the novel was charactertized by its sheer generic diversity.” His writings helped to curb the pessimistic strain of “high” cultural responses to urban life in the re-creation of a comic London, offering an alternative to the gritty city slums and intensely private spaces portrayed in many naturalist modern urban writing. Yet, as several of the essays attest, jest is often a conduit for unexpected wisdom or sharp political comment. The collection covers the full scope of Chesterton’s eclectic corpus, referring to his fiction, poetry, journalism, criticism and apologetics literature. Matthew Ingleby’s introduction positions the volume in the context of recent interest in all things Edwardian, arguing that the nostalgic pastoral gloss of recent TV adaptations of Father Brown’s adventures is indicative of the current popular image of Edwardian England. It is this narrow (and in the case of Father Brown, just plain wrong) vision of Chesterton and the Edwardians that the volume sets out to correct. Michael D. Hurley’s opening chapter addresses Chesterton’s love of London as an unending source of fascination, as a city that captured his imagination through the “romance of detail in civilisation” and the “joyous mystery” of strangers’ lives felt at such close proximity. The city scape offered a unique chance to observe the soul of man through the shape and texture of his environment. Hurley distinguishes Chesterton from Blake and Wordsworth, his romantic predecessors, arguing that he chose to meet city life with a childish excitement that led to his ability to counteract London’s false promises, felt so crushingly by many of his modernist contemporaries (T. S. Eliot, Pound), with a redemptive hope that innocence was ultimately matured by experience rather than destroyed. This chapter sets up many of the themes that are to be picked up again later in the collection, such as Chesterton’s complex attitudes to antiquity and modernity, his relish of English independent-mindedness and his individual brand of romance. Although the collection veers away from too close an examination of Chesterton’s spirituality, a subject which has already merited great attention among Chesterton scholars, there is still space for a productive discussion of the influence and impact of Chesterton’s faith on his work. The religious meanings which actively shape Chesterton’s worldview are drawn upon to varying degrees by Mark Knight, “Signs Taken for Wonders: Adverts and Sacraments in Chesterton’s London”, Nick Freeman, “Chesterton, Machen and the Invisible City”, and Colin Cavendish-Jones, “Estranging the Everyday: G. K. Chesterton’s Urban Modernism”. From the diversity present in these three essays it becomes obvious that to pigeon-hole Chesterton as a “Christian writer” is to limit the appeal and interpretation of much of his work. Although his sincere faith is a motivating and influential element in his subjective perceptions, and therefore the structure of his writing, Chesterton avoids dogma by linking the general principles of faith with a fervent love of the individuality of the particular. As both Knight and Freeman discuss, Chesterton’s faith provides him with a code for unlocking the symbolism latent in the city streets. Interestingly, this is a practice which allows him to open up a greater potentiality of meaning and to resist interpretative closure. Knight takes the debate in a stimulating direction by arguing that detective fiction is a secular version of fundamental religion. He reads Father Brown as a foil to the populist Holmesian “empirically scientific” approach to solving criminal cases which had such an important influence on the Edwardian imagination – famously, readers were so convinced by Holmes’s verisimilitude that they wrote to him for advice on real cases, blurring the boundaries between fiction and reality. Freeman also sees the Christian meanings brought alive in Chesterton’s London as the liberating element in his writing which, in the tradition of Robert Louis Stevenson’s New Arabian Nights, enables him to adopt the city space as the site of modern romance,. Rather than getting caught up in impressionist expressions of modernity’s “bottomless” meaninglessness, he argues that Chesterton and Machan, liberated by their religious conviction, find a more playful, entertaining city than so many of their modernist contemporaries. Several essays note Chesterton’s ability to recapture the true medieval sense of romance, continuing in the tradition of Robert Louis Stevenson, Walt Whitman and Robert Browning. Matthew Beaumont, “The Knight Errant in the Street: Chesterton, Childe Roland and the City”, argues that Chesterton’s response to London attempts to reinstate the epic as an alternative form to naturalism. By diversifying the Edwardian literary response to urban life in this way, Chesterton was opening up new ways of conceiving the modern. Similarly, in his contribution to the collection, Merrick Burrow analyses how Chesterton’s forays into clubland unsettle the certitudes presented by the city; he finds an eccentric, anti-social, fraternal dynamic in Chesterton’s rendering of London’s nightlife which defines an alternative Edwardian “queerness” as distinct from the 1890s’ brand of hedonism. A further instance of Chesterton’s queer way of seeing the world is central to Matt Ingleby’s essay on the romance of burglary. Ingleby argues that Chesterton’s take on the romantic figure of the burglar makes explicit the connection found more widely in Edwardian fiction, where the burglar acts as a cipher for anxiety over bourgeois suburban security and social inequality. This kind of elaborate “Robin Hood” attitude towards property is part of the proto-Bakhtinian strain of Chesterton’s thought which celebrates the carnival logic of topsy-turvy agency and power. Such a love of inverting social position, status and authority is teased out in Michael Shallcross’s discussion of Chesterton’s love of the rebellious London which resists the status quo and refuses to be tamed into respectable forms of play. Shallcross argues that Chesterton uses this “unofficial” spirit in his detective fiction to critique class segregation in the city, an evil which he sees as being a direct consequence of the misdirected efforts of educated Edwardian philanthropist “do-gooders”. Lynne Hapgood’s chapter also employs the carnivalesque to explore Chesterton’s work as a means of recapturing the medieval purpose of parody, a technique which allows her to tease out images of a different world order, initiating a form of modernism which privileges a dialogue between past and future. Hapgood sees this in The Napoleon of Notting Hill, which imagines the re-emergence of the old villages that originally came together to form modern London. Chesterton’s romantic predisposal to capture a visionary glimpse of another world is here applied to the window onto the past offered to those who would only take an active, purposeful look at modern architecture and design. Much of what concerned Chesterton about modernity was located in the Edwardian state’s predisposition towards singleness at the expense of the plurality of mystery – a feature which he noted to be particularly virulent in imperial policy. Chesterton’s romantic relationship with the past and his reservations with contemporary politics don’t stop him from finding poetic beauty in urban materialism. This tendency is repeatedly illustrated in various essays by reference to Orthodoxy in which Chesterton famously argues that the beauty of the city is all the more profound than equivalent spectacles in nature for being formed by and expressive of the work of conscious minds. Cavendish-Jones iterates it, “[in Chesterton’s world] if the tree is a magic tree then the iron lamp, by the light of which one sees the tree, is even more magical” (GLM 193). This ability to transform the everyday objects of the urban jungle into things worthy of notice and contemplation is one of the great strengths that make Chesterton’s perceptions so unique and powerful. Despite the many common themes which unite the essays in this collection, there is enough controversy in evidence to prompt further avenues of discussion. Several key questions regarding Chesterton’s attitude to London and modernity are left starkly unreconciled. Part of the romance of the Chestertonian city is located in its past, yet Matthew Taunton’s “Distributionism and the City” finds in Chesterton an increasingly radical modernising agenda that is deeply “anti-urban” and worries over the dangerous dependence of the many urbanites on infrastructure owned and provided by the few. Similarly, although several essays examine the fairy-like magic that illuminates the Chestertonian city, the collection concludes with Julian Wolfreys’ warning not to miss the unremarkable city at the heart of Chesterton’s London, lest this turns out to be the point. Chesterton is seen as inspired by the natural chaos of the urban scene, yet he is also held up as a lover of order. In the debates surrounding his relationship to modernism, the collection is helpfully indecisive in determining the shape of that modernism. He is opposed to fin-de-siècle decadence, the impressionists, symbolists and cubist expressions of modernism, yet marshalled into line as a descendant of Stevenson, Whitman and Wilde. There are traces of later philosophical thought to be found in Chesterton’s musings on modern life – particularly Walter Ong and Marshall McLuhan – but he is also an example of a medieval romancer. Most interestingly of all, Chesterton emerges as ambivalent in his love of London, the city in which he found so much pleasure. Maybe it is in these inconsistent eccentricities that Chesterton reveals himself to be so typically and deliciously Edwardian. Lynne Hapgood, “The Chestertonian City: A Singularly Plural Approach” in Matthew Beaumont and Matthew Ingleby, ed., G.K. Chesterton, London and Modernity (London: Bloomsbury, 2013) 44. This entry was posted in Reviews and tagged edwardian literature, edwardian london, G. K. Chesterton, london and literature, urban writing. Bookmark the permalink.